now VIN is at 1.15,about €35mln in market cap. VIN holds now €30mln in cash, about €26mln in good stock shares(who are on their lows) and total liabilities about €7mln,so no debt... not to mention all the credits,physical assets that it owns. with my analysis VIN's value is around €80-90mln,thus between 2.6-3.0 per share. -after years of inactivity the company is in work progress to install a huge solar power plant,thus a way to invest the huge cash it has and hopefully producing a decent income(and dividends)...and of course it will be more visible to investors. My concerns when I looked at the company previously were the quality of earnings, and margin of safety. I want to take a look at both of those items seven months later. Right away the first thing that hits me is that the discounted NCAV is almost double the current price, this is rare. What's even rarer is the composition of assets that the company has. On the balance sheet €60m is in cash and publicly traded securities, liquid assets that could be sold today and fair value realized. The securities are holdings in two companies Assicurazioni Generali SpA and Cementir Holding SpA, both Italian securities. Taking this right off the bat we have a stock with €60m in cash and securities with €7m in liabilities (none of it debt), or a net-cash position of €53m against a market cap of €38m. The company is selling at a discount of about 28% to the net cash value. What I really like about Vianini Industria is something Mauro pointed in the comment was that the company has some hidden assets. The details are found on page 29 of the HY report in note 1. The note discusses the property plant and equipment account, following the discussing of the balance sheet values is the following translated text, "The following are the values of tangible assets fully depreciated but still in use. This is an interesting note, basically the company has €47m in assets that are being used to create cement products that aren't reflected on the balance sheet at all. These assets consist of the the land the cement plants sit on throughout Italy and the cement facilities themselves. Even though these assets don't have an actual balance sheet value they have a very real world value, these are the assets the company is using to generate it's non-financial returns. In my net-net worksheet I only give these assets a value of about 10%, but that's probably on the low side. In reality the assets are probably worth a bit more, my question would be who is interested in the properties and equipment. I'm not sure how many other cement companies are operating in Italy that would be interested in swallowing the Vianini Industria operations. Secondly the land appears to be in some very rural places, so I'm not sure if a ready buyer would emerge quickly. Discounting 90% takes all of this into account and gives a wide buffer for error. Overall on an asset basis Vianini Industria is very attractive, and selling at a deep discount. When I previously looked at this company one of the things that concerned me was that most of the company's earnings was from financial income, or dividends of holding companies verses operating earnings. The operating earnings record is quite poor and very lumpy as seen below. For the trailing nine months EBITDA is barely positive, and after taking a depreciation charge operating earnings are negative. This was a big concern I wasn't able to overcome previously, but my thinking has changed some in the past seven months. First and foremost I always want a stable margin of safety, the last thing I want to do is invest in a company that is destroying the margin with a large cash burn or terrible acquisitions. I don't see either with Vianini Industria. The operations of the company are very poor, but the difference is made up with dividends from other cement holdings. In addition the company has a high amount of operating leverage, meaning if the cement market starts to have an upturn earnings could shoot up dramatically for the company. The company currently has a backlog of about €8m in projects, with the possibility of €9 more in extensions. The company also has started supplying cement to a new energy plant which Mauro mentioned and is mentioned in the HY report. Taken together this is about another year or year and a half of earnings at the current pace before new works needs to be found. I would prefer that the company earn a 15% ROE and have great operations but that's unrealistic considering I'm able to buy the assets for less than 50%. With Vianini Industria I'm buying the assets, and my hope is that the operations aren't acting against me, which they aren't. The margin of safety for Vianini Industria is very obvious, the company has a large amount of liquid assets in excess of its market cap, additionally they have some hidden assets, and a business that isn't eating at the asset value. I keep trying to think of the worst case scenarios for Vianini Industria in an attempt to kill the stock. The cement business hits a downturn - This is already true, I guess it could be even worse and there is a complete stop to railroad construction in Europe. I believe this is already priced into the stock, and additionally even at low levels of production the company is squeaking by and just barely covering costs. Secondly most of the company's earnings don't come from the cement operations, they come from dividends of other cement companies. Their equity cement holdings could eliminate their dividends - This is a risk, although considering the market environment and they fact they're still operating and able to pay a dividend currently I think it's probably fair to say they'll be able to continue in the future. Even if the holdings cut their dividends 50% Vianini Industria will be able to record a profit. All cement production in Europe ceases - This is truly the worst case scenario, Vianini Industria would be operating at a loss, and so would the equity holdings. In this case if they didn't cut any staff or costs they have enough cash to survive a complete halt for five years. The Caltagirone family takes it private or takes the cash and securities - This is probably the biggest risk, the family holding the company takes it private at some low multiple. The family already has control of the company, and the company supplies the other family companies. While this is a risk I see it as a unlikely risk. If none of those scenarios play out the company has enough cash to weather a very long dry spell in the cement business. I feel that I'm adequately protected against a loss by buying the assets at such a big discount, additionally once earnings turn around I think the stock could begin to rise quickly. There are some obvious reasons why Vianini Industria is cheap, and the reasons are pretty good, I'm just going to list them out. The company is 66% controlled by the Caltagirone family, only 33% of the float is public. The actual business is pretty bad, low margin, loss making, terrible return on equity. The stock has a small market cap, and is priced around €1, not much institutional interest. There are a lot of related party transactions with other family controlled companies, it's possible Vianini Industria isn't getting the best prices for their goods, or they are overpaying for materials and supplies. All of the above reasons are perfectly valid, and if I was looking at Vianini Industria as an investment into the cement making business I would probably avoid it. The key to this stock is that the value doesn't reside in the business, it resides in the assets, and the hidden assets. The question I asked when looking at Vianini Industria is do I think that cement production will completely halt in Europe for five years? That's my worst case scenario, and the scenario where this is a losing investment. I don't think that will happen, I have an adequate margin of safety protecting my investment and the company has the resources to wait out the downturn. Disclosure: Long a small stake in Vianini Industria looking to increase it over the next few days. What are the other Caltagirone family-controlled businesses? And how big are they compared to the Vianini Industria? VIN “lends” 38 Mil euros to a related-party business and get’s back 10 cents on the dollar after write-off of “bad” loan. Thanks for the comment, thanks for being a reader. As of now Vianini Industria is about €38m market cap, Vianini Lavori €163m, Caltagirone €174m, Caltagirone Editore €174m, Cementir €272m. Vianini Industria is a supplier for the Rome Metro Line C project where Vianini Lavori is actually the construction company doing the work. So with regard to the risk that the company could extend a loan to another family-controlled business, this risk is real and actually exists. I didn't discuss it in the post, but Vianini Industria actually has another €30m on the balance sheet, it's a loan to a company they invested in a few years back. From what I could find the loan is interest free but callable by Vianini Industria at any time. Because of the lack of interest, and the uncertainty of realizing the loan value I just wrote it off to zero in my analysis. Hope this helps. It's worth looking into some of the other Caltagirone companies as well, it seems the company is still cheap on a sum of the parts. There's value in other parts of the company as well, Vianini Lavori seems to have much better operating metrics, and Cementir about 5x FCF. Thanks a lot for your analysis,Nate, a very good one!! Great post, looks like a very interesting opportunity. I was just wondering from which report you source the numbers from. I can't seem to match them with the financial reports. The hidden assets are still on the balance sheet, less accumulate depreciation of course. 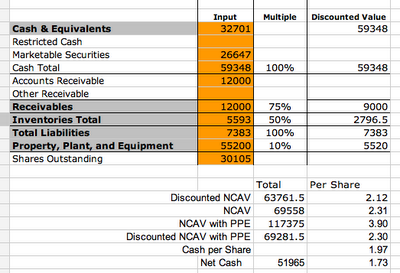 You could also simply include the total value of the PP&E entry (61m) and then apply your discount. Thanks for the comment. I didn't really look into the Generali holding much, it appears to be outside of the family holdings, I wonder why VIN invested? With regards to the solar plant, are they just constructing it, or are they building it themselves? If they're building it and owning/operating it there is a lot more risk. If they're just supplying cement this is a very good turn of events. I agree with you on the loan outstanding, I already wrote off the value in my analysis. I pulled the numbers straight from the reports on their website. I did a few things on my own.. I took the HY numbers for the stock holdings, and then adjusted the holdings down to their current values. Since the most recent report doesn't have a detail breakout of receivables/inventory I took the current assets number from HY and the current assets from the most recent report, figured the difference and applied the same discount to each item. The receivables/inventory might not be accurate exactly individually but in sum they are accurate. Hopefully this helps. If you can find financial statements for the most recent quarter that are accurate I'd love a link. Hope you’ll take a look when you have a chance. Greatly appreciate if you would give a shout-out for this debut on your blog, and if you become a reader and want to recommend/link to my blog at some point, I’d also greatly appreciate it! Once I figure out how, I will be Blogrolling you and perhaps adding a few widgets. And, of course, any comments or advice on posts and blogging always welcome. I took a brief look and really like what you have going. I'm going to read through tomorrow morning and send a shout out on Twitter. You've dug up some really interesting stocks with a lot of potential. As you know the more offbeat the better in my book. I've found blogging to be invaluable in helping me develop my thought process on stocks. Having to write everything down and think it through has helped me clarify my thinking. Yup, I suffered through writing a daily market commentary (at about 7am daily!) for years until I realized (and forgot since) how useful it was in developing/crystallizing my precise views on the market. So I guess a blog is ultimately a selfish endeavour for me!... Hopefully it will assist in my stock selection and portfolio development, and maybe for some readers too, we shall see..! I checked again and you're right,the "hidden assets" are on the balance sheet. Although considering the depreciated assets I would take in account the full value of Inventories(I mean I wouldn't discount it again as Nate did). Caltagirone is member of board directors in Generali and has ambitions on becoming ceo. About the powerplant,on the official documents you won't find much. Btw, there's a guy from an italian finance forum who lives in binetto(the same city of the plant) and got interested in VIN. He went to the municipality and discovered that VIN itself is going to spend about €40mln for the project and of course it will be the owner. The project is not only a solar power plant,it includes also a mall and an educational center. VIN already owns the land and it's ready for construction. There's one step left, VIN has to present the complete project details to Binetto's municipality. In 2012 VIN should start constructing it. Note that VIN created a subcompany called Vianini Energia,so they want to go in the energy business which is new for Caltagirone: so VIN is going to be the first one in that segment and it should "heat up" on the medium-long run,and hopefully stop making stupid loans to family companies. I believe this is a very good move now,but I'm not amazed since from early 2011 there's a new member in the board of directors whom is a known shareholder that continuosly incited to take action and maximize the stock price. Ok €40mln is a big investment,half the assets,but it will give steady returns(selling electricity and collecting the rent from the mall). The project is considered a "green" project,so it's very likely that they may receive EU's funds too. Great information, I really appreciate the perspective from Italy as well. I noticed the subsidiary in the notes on the HY statement. I'm really split on this project, it's a lot of cash, yet it has the potential for return which VIN needs. If the project is a good investment then it's a lot better then having cash sit around. Another question, I did some Googling of Binetto and found the VIN plant on Google Street view, the place looks pretty empty. Do you know how many facilities they have in production? I seem to remember they had four or five cement plants, but based on the number of workers and low production I'm guessing maybe only one or two plants are actually open and running. Do you know if the Binetto factory is abandoned, that's probably the land they're going to use for the power plant or the mall. I noticed a bunch of the cement pipe they made there on the property but it looked like the pipe had been there a while, there was a lot of high grass and small shrubs around some of it. If you'd rather continue the conversation offline feel free to email me at oddballstocks@gmail.com. great post.i own some shares in Vianini Lavori. My major problem with Italien companies is Corporate Governance. I owned shares in another Italian company called "EMAK Spa". Cheap stock wih steady earnings. 3 months ago, the majority owner decided to sell some of his other enterprises to EMAK. The result was a massive dilution for minority shareholders. I think as a minority shareholder you don't have any chance to do something against this. I've looked into Vianini Lavori a few times, the company is a bit higher quality than Vianini Industria. I looked at Emak recently as well, never bought it but followed the merger/dilution fiasco. It's a shame really, the only guard is to buy cheap enough that even in the event something like that occurs a profit can still be made. Have you looked this other (and much bigger) italian holding: EXOR. It owns 30% of FIAT IND an FIAT (wich owns 56% of Chrysler), with a discount of more than 37% of market value. Besides, probably the market value of fiat ind is undervalued (P/E of 10 with a growth of more tan 15% y/y). Many thanks for the Twitter shout-out for my new value investing blog - much appreciated! I'm putting up some posts on EIIB - I think it's the type of stock you like to look at/anayze, I believe I might have mentioned it before. Is the topic connected with your professional field or perhaps is it mostly about your leisure and free time?